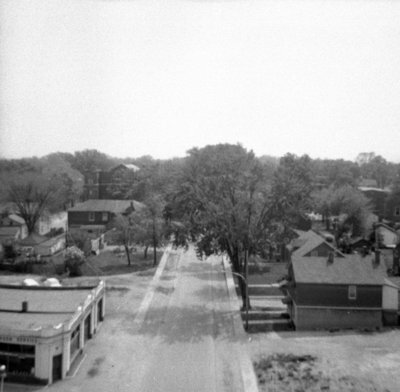 A black and white photograph looking south from All Saints' Anglican Church Steeple. This view is of Centre Street South. Click the links on the right side of the page to see the same view on September 13, 2013 and ca.1900. Looking South from All Saints' Anglican Church, May 1964, Brian Winter. Whitby Archives A2013_004_355.